We were once nice Catholics boys. But somewhere early on (we think their names were Laura and Stacy) our Catholicism began to lapse. Our descent continued until completion with our transition from New York City to Guatemala. Here we’ve accepted our fate as F.C.C.’s: Fully Collapsed Catholics. As F.C.C.’s we have no delusions about someday seeing the Pearly Gates. We save our delusions for this world. But as Spring is in the air this Easter Season, we celebrate with our Christian brothers and sisters, as we do with any religion based on love and the possibility of redemption. While not deeply religious, we are still quite spiritual. (Just note all the spirits in the photo above!) For us, finding communion and atonement involves peering “as through a rocks glass darkly” (Cor. 1:13) to the world of holy perfection. And we always do so under the watchful eye of our dearly departed F.C.C. (in his case, a Fully Collapsed Calvinist) Bo Wilcox. Like the Maximón of the Maya the Boximón of Café No Sé is a cross between a household saint and a hitman. 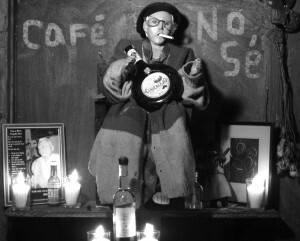 To Boximón we make offerings of cigarettes and gin – and in return he helps us with life’s little difficulties. Recently, we took some of La Cuadra’s problems to Boximón. We told him that we were in need of more writers. We told him that we needed help with advertising sales. We told him that we needed more artists and poets to feature. We told him we wanted to expand our little rag up to the Lake and down to the Beach. We prayed, we made offerings and we awaited his advice. And so we take Bo’s counsel. Friends, La Cuadra is looking for more writers, artists and poets to feature in our upcoming editions. We’re also looking to bring on an ad sales person. If you’re interested in helping out drop on by our office at Dyslexia Bookstore or shoot an email to: editor@lacuadraonline.com. The pay is lousy and the hours are worse, but you do get your very own conduit to the afterlife. Provided he’s not trying to bed some vixen in the netherworld.